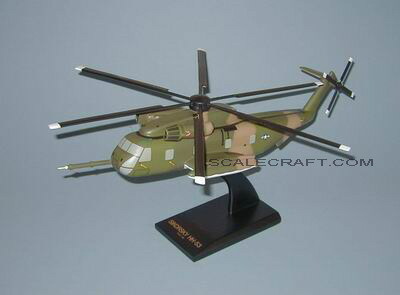 The Aerospace Rescue and Recovery Service's Sikorsky HH-53 Super Jolly Green Giant entered the Vietnam conflict in 1967. It quickly began flying with the 3rd Aerospace Rescue and Recovery Group. The Jolly was the largest, fastest, most powerful heavy-lift helicopter in the Air Force inventory, capable of carrying 38 passengers, or 24 litter patients with four attendents plus a crew of five at speeds up to 195 miles an hour. It could even carry heavy loads on a sling underneath. To protect itself, the helicopter had three 7.62 miniguns capable of firing 2,000 to 4,000 round a minute. It was air-refuelable from HC-130N/Ps. Most South East Asie rescures were carried out by a Search and Rescue (SAR) Task Force composed of Jollys or other helicopters, Kings (HC-130s), Sandys (A-1s), and fighters (usually F-105s and F-4s). The King was the On-Scene Commander. The fighters "sanitized" the area. Once clear of the enemy, the Sandys would bring in the Jollys, providing close-air support while the helicopter hovered to pick up the survivor. Between 1964 and mid-August 1973, rescue forces saved 3,883 lives at the cost of 71 rescuemen killed, and 45 aircraft lost. They truly lived up to their motto-"That Others May Live." Mahogany Wood. Scale: 1/48. Rotorspan 19 1/2 inches, Length 18 1/4 inches.